UNIVERSITY OF MICHIGAN UofM STADIUM PHOTO AERIAL PHOTO picture print - ANN ARBOR, MICHIGAN UofM Michigan Stadium Aerial photo art picture print photograph for sale - Michigan Stadium U of M aerial photo picture art for sale: This aerial UofM Michigan Stadium photo of a packed University of Michigan Stadium in Ann Arbor was taken in the Fall of 1999. 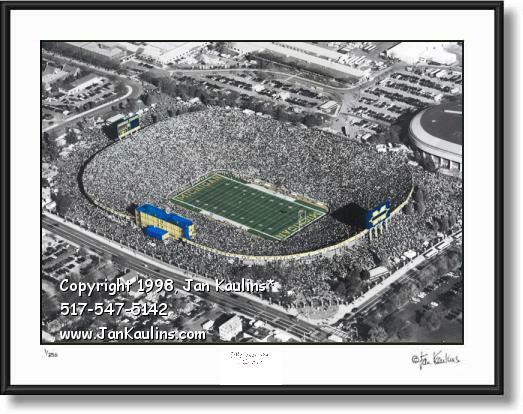 This Michigan Stadium aerial picture photo is made from an original black and white photograph that was hand-colored by nationally recognized artist and photographer Jan Kaulins. In this aerial University of Michigan Stadium photograph we see that it is halftime, many of the 100,000 plus Michigan Wolverine fans mill around the outside walls of Michigan Stadium and the Michigan Marching Band is about to take the field. The post 9/11 ban on low flying private airplanes over major sporting events makes this a historical and collectible Michigan Stadium aerial picture photograph. This aerial Michigan Stadium photo would make a great gift for a member of The University of Michigan Alumni Association or a current U of M student. Go Blue! TO SEE THE OTHER UofM MICHIGAN STADIUM PHOTOS AVAILABLE IN THIS UofM MICHIGAN STADIUM PHOTO GALLERY CLICK ON THE 'Back To U of M - Ann Arbor...Photo Gallery' LINK ABOVE THIS PHOTO NEAR THE TOP OF THE PAGE.